ShopKeep is a cloud-based point of sale software for iPad with customized features for a wide variety of business types. Restaurants, coffee shops, retail, bakeries, concessions, and many other business types can use the ShopKeep POS to take orders, payments, keep track of inventory, capture email addresses, manage staff, and access reporting on business activity. The system works even offline. ShopKeep allows businesses to customize menus and/or product offerings based on reports that show which items are more popular, sell the most, and bring the most profit. Scheduling staff is more efficient, as reports show the busier times, so staff can be scheduled according to business need. Inventory can be tracked, and ShopKeep will alert staff when ingredients or products need to be replenished. Orders can be sent directly to the kitchens of food service businesses to expedite the order process. Checks can be opened, closed, and managed from multiple “registers” and can also be split, merged, or transferred for quick check out. ShopKeep offers complete customization, from the hardware used, to the set up of the software and the reporting. Orders can be created with custom modifiers or notes, to assure clarity and accuracy. Items can be added by tapping, searching, or barcode scanner. Sales tax, item quantities, or discounts can be toggled or entered in the register module of the software. A variety of payment types can be accepted, including cash, credit (even EMV chip cards), or mobile payments. Receipts can be printed and/or emailed. ShopKeep allows for shifts to be opened and closed, summarized and reported on, and maintain an accurate cash drawer. Shift reports can be printed directly from the register, and real-time reporting is available using the ShopKeep Pocket App, available on multiple platforms. 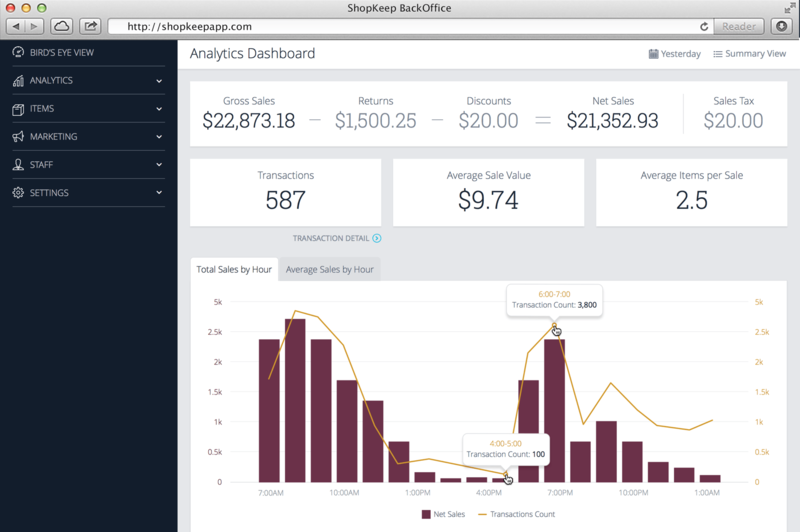 Not sure ShopKeep is right for your business? Use our POS Software Product Selection Tool to compare other POS Software solutions. Have questions? Call or email one of our unbiased Technology Advisers for a free consultation. Learn everything you need to know about ShopKeep. Our experts will reach out to you shortly.